Clasp/Buckle: Stainless steel Rolex deployant clasp stamped "18" and "78350"
Reference 6263 was in production - together with its metal-bezel sibling reference 6265 - since the late 1960s until 1987. 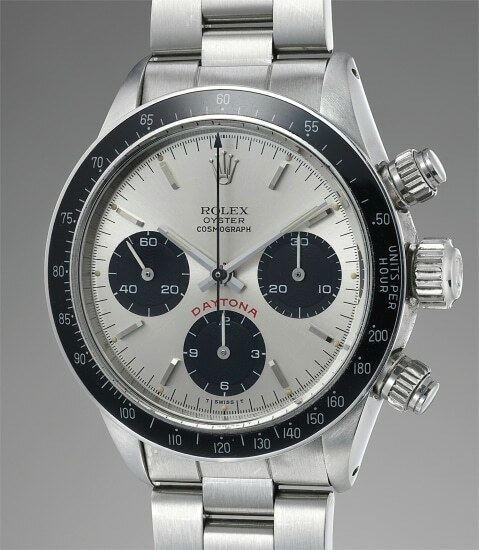 The final evolution of the manual Daytona line, it is considered by many the most representative and iconic reference of the line, incorporating all the details which made the Daytona a masterpiece of design: bezel with black insert bearing a tachymetre scale, screw-down pushers, and the unmistakable Rolex Oyster case. The purity of this configuration, especially when it comes in the white dial variation, allows not only for perfect legibility - after all, the Cosmograph was first and foremost a tool for racers - but also grants the timepiece an undeniably enormous aesthetic impact thanks to the black/white chromatic scheme which alternates obviously on the dial, but on the case as well thanks to the black bezel contrasting with the shiny metal. So pleasing and appealing this design is, that in fact it is the obvious inspiration for the universally acclaimed contemporary Daytona model with ceramic bezel. The present specimen distinguishes itself for the presence of its original box and Guarantee but especially for the superlative condition of its dial. Without a flaw and still retaining all luminous accents without trace of losses, it is hard to imagine a better preserved Daytona dial.